Tired of the original quest frame? This addon aims to enhance the readability and immersion when questing in World of Warcraft. It adds a brand new quest frame, with animated models and fancy effects. 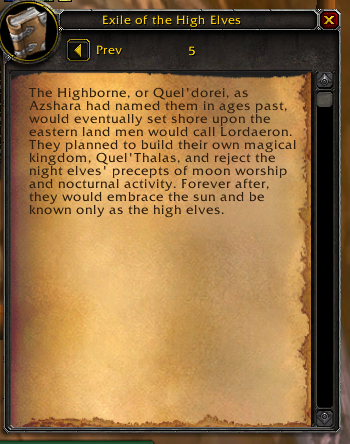 If you like to read all quests and are a fan of the World of Warcraft lore, this addon is for you! Storyline provides a new quest frame, that panel appearing when you get a quest from an NPC. World of Warcraft UI improved over the years but one thing Blizzard never touched is this hideous Quest frame. We wanted to have a quest frame inspired by the garrison frames dynamism. Storyline frame adds 3D animated models for you and your quest giver. Also it "cuts" the dialogue into multiple parts, playing one after another in an old-school RPG style. Finally, it adds more effects and visuals to express objectives and rewards. Fullscreen mode. We will ad fullscreen mode with a specific layout in a future update. Storyline is too big. Please do a version without the 3D models, just the text. You might want to take a look at the Immersion add-on instead. Scaling issues The game has no way to display two model with the appropriate scale. We need to scale each model against each other. This operation takes time and we will improve on this over time. In the meantime, you can manually resize incorrect models by scrolling on the model while maintaining the ALT key down. Disable Storyline for daily quests. We want to add a blacklist system where you would be able to mark an NPC so Storyline doesn't show up. Also, we want to add an option to only show Storyline once for daily quests, so that you can still read them comfortably the first time. We will implement these features over time, but the game's engine being picky and weird in these old parts of the UI we are quite limited in what we can do here. Hi. Is this addon abandon? Thanks for answer) Good luck! Really great addon and using it since I came back to WoW 10 months ago. Just got an error at logon showing this. It doesn't seem to affect the addon functionality but I think is good for you to know. The error doesn't actually come from Storyline, it's a mistake caused by the tentative fix from the latest update for the library errors. This will be resolved in the next one. Thanks and I just noticed that the previous error only happens when I reload UI and the following happens when I start the game. I love your addon so much :). I was wondering if it were possible to skin the interface for books in game. You do such a great job at making the quests look amazing, I was hoping you could do the same for books. The standard ui for them is awful. Thanks for creating such a cool addon! Hello. There already is a button to rewind the dialog in the bottom right corner, and the associated hotkey for it is backspace (⌫). There is no way to go back further than the current text due to technical limitations with in the game. If you want to go back to the previous dialog you have to close the window and talk to the NPC again, an addon cannot start that kind of interaction itself. No other add-on I've used has ever don this, so I've been wondering what this was about. Can you help me out here, coz my first thought was that this was malware that somehow attached itself to your add-on. It’s the embedded YouTube video on the addons description. The Twitch client cannot play flash video and CurseForge keeps trying to display embedded YouTube videos as Flash, which causes a file to be downloaded (it points to the video) since the client doesn’t know what to do with it. I have reported this issue to Curse several time but they don’t seem to be bothered by it. Not harmful, no. I don't think Curse will fix that anytime soon (or ever, really...) but it seems Ellypse removed the video from the description, so it shouldn't happen anymore. Hi everyone. If you came here today to report an issue with the 3D models being incorrect in Storyline, know that you can disable this year's April fools' joke in the miscellaneous settings of the add-on. In love this AddOn, it’s become my favorite in fact! Is there any way to change the background? I love the parchment look but it’s a little distracting/tiring on the eyes after a while. I’d love to just make it white font on a cool, dark color like black or deep blue!